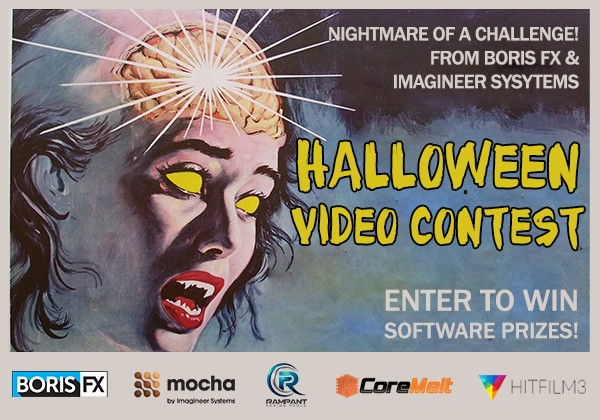 We’ve teamed up with a bunch of awesome VFX friends to bring you our annual ghoulfest contest! And prizes from Rampant Design! Submit a short “scary, spooky, Halloween inspired” video (no longer than 5 minutes). All videos must use mocha AE or mocha Pro or Boris Continuum Complete for some aspect of the post-production/vfx. Contest ends: October 30th at the strike of midnight PST! Create an interesting or scary or humorous “Halloween” inspired short video that uses any of mocha AE or mocha Pro’s features including: Planar Tracking, Rotoscoping, Screen Inserts, 3D Camera Solve or Object Removal; or Continuum Complete’s features including: titling, 3D objects, particles, lights, and more. When your video is ready to be viewed email us the link, your full name and email address. All content must be yours. Only original materials will be considered. Have fun! This is an opportunity to learn something new and promote your work. Need some inspiration? Check out our Halloween tutorial along with last year’s winners!